Media messages are everywhere, online, in the news and environmental print surrounds us. We are immersed with visuals and auditory messages constantly. This is why we need to be diligent when interpreting what the message is telling us by asking questions about what we see and what you hear. We need to distinguish between facts, opinions and the judgements of others at all times. 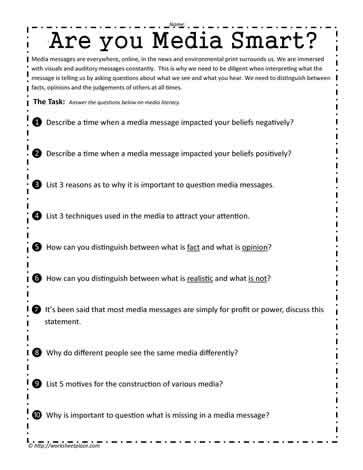 The Task: Answer the questions below on media literacy. ❶ Describe a time when a media message impacted your beliefs negatively? ❷ Describe a time when a media message impacted your beliefs positively? ❸ List 3 reasons as to why it is important to question media messages. ❹ List 3 techniques used in the media to attract your attention. ❺ How can you distinguish between what is fact and what is opinion? ❻ How can you distinguish between what is realistic and what is not? ❽ Why do different people see the same media differently? ❾ List 5 motives for the construction of various media? ❿ Why is important to question what is missing in a media message?